Université Libre de Bruxelles and Research & Degrowth are cordially inviting you to a seminar day. 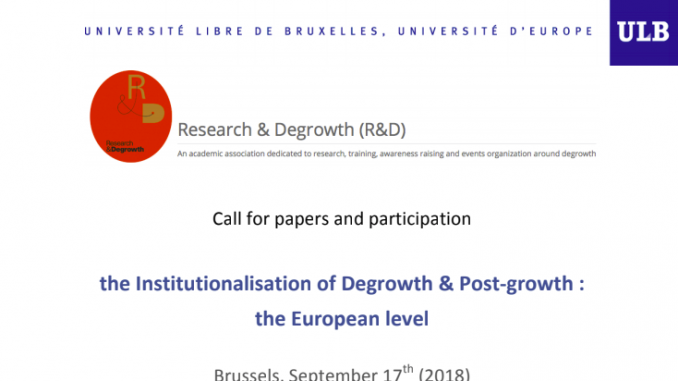 A major degrowth & post-growth conference (http://www.postgrowth2018.eu) convened by European-level stakeholders (Members of the European Parliament from different political groups, academics, NGOs and unions) will take place in the premises of the European Parliament on September 18 and 19 (2018). At the heart of the European Union decision-making, the 2018 conference will offer a unique opportunity for the EU civil society and the degrowth and post-growth communities to exchange their views with those of EU officials and staff who define the core of the European economy. The aim of these 2 days – about one year before the next European elections and the nomination of a new Commission – will be to support a wide cultural contagion effect within the EU-institutions by which the thinking of policy makers could tilt towards genuine sustainability. These 2 days at the EU-Parliament will be preceded by a preparatory and learning seminar at the Université Libre de Bruxelles. 1° learning from experiences: there are numerous accounts of cultural and scientific contagion which have taken place at the EU-levels since the existence of the European institutions. We convene a set of friendly analysts and activists who lived – in the near and far past – such institutionalisations from within different EU-institutions; the aim is to debate with them in a plenary session on the mechanisms that prevail within the institutions, on the inertias, on accelerators and things to avoid, buttons to push, issues to raise repetitively. 2° crowding together on the most pressing policy agendas: scientific and activist communities are extremely lively and many things happen on specific agendas without everybody being updated. In fields in constitution like ours, we move also in different directions, explore adjacent but diverging hypothesis and questions. It seems important in terms of collective preparation to walk into the EU-institutions with a common understanding where our fields are in terms of their factual state-of-art, as well as in terms of deriving policy questions. The seminar will organize, in the morning, around a plenary session on past and on-going experiences of institutionalising ideas, concepts, questions… into institutions, and in particular at the EU-level, and in the afternoon, around a series of thematic parallel sessions with a limited set of themes (typically 4 to 6 working groups and bring us collectively and content-wise into gear for the 2 days at the EU-Parliament. The present is the call for papers and participation to these thematic panel sessions of the seminar. 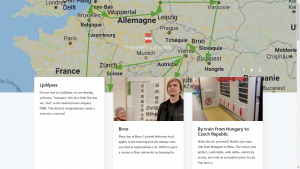 You are interested in participating actively to this collective challenge? Send us a mark of interest (+/- 500 words) by June 3rd, 2018 to Julien Vastenaekels (jvastena@ulb.ac.be), Grégoire Wallenborn (gwallenb@ulb.ac.be) and to Tom Bauler (tbauler@ulb.ac.be). MORE INFO: See this document for more detailed information on background, organisation and practicalities. me parece enormemente grandioso este tipo de artículos , ´para quienes deseamos ampliar nuestros conocimientos en el variado campo de la economía mundial, saber que nuestros destinos están ya trazados si continuamos siendo marionetas de este sistema de mercado, pero tener conciencia critica sobre esto, lograra una gran diferencias.